What Is Generac 6602 Good For? When you think about raw power, think Generac. This manufacturer of power generators decided to throw their hats in the pressure washer game, and they went straight to heavy-duty machines. 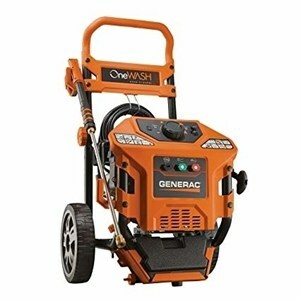 In the following Generac 6602 review, we will try and answer all of the essential questions regarding this power washing unit, including its traits, pros and cons, and overall performance. The Generac company is known for making powerful equipment and 6602 is no exception. This gas-powered power washer is equipped with a 212cc OHV engine, which is largest in its class. This enables the unit to provide a maximum of 3,100 PSI at 2.8 GPM, making the total cleaning power score 8680, which is quite high for a residential pressure washer. When it comes to design, you can see right away that Generac has been in the business of power tools for quite a while. Their industrial design follows all modern trends without exception. The unit weighs a total of 76 pounds, making it a rather hefty pressure washer, but Generac mounted the whole body on two `never flat` wheels to ease the transport as much as possible. The engine is mounted in a horizontal position, making ergonomic solutions like easily-accessible hose connectors and simple oiling process possible. On top of that, the unit`s handle can be folded so you can save some storage space. The 6602 model is equipped with a `PowerDial`, a system that allows you to choose between 4 power modes. Depending on the job you want to get done, you can simply select the best mode for keeping sensitive surfaces safe and unharmed. On top of that, you can modify the spray output with 3 provided quick-change nozzle tips. You get 0-degree, 25-degree and soap nozzle with this power washer. Combined with 0.75-gallon drainable detergent tank, you can tackle any surface and stain. Being that it is a heftier gas-powered washer, lack of electric cords lets you clean vast areas with ease. With a 30-foot long high-pressure hose, you can also reach any place that needs professional cleaning. Generac has a user-friendly website packed with tutorials on how to use their equipment, and they heavily insist on customer feedback. You can even see the assembly process there. When it comes to warranty, Generac offers a two-year warranty policy, with the first year covering every part of the power washer, and the second year covering only the engine. This is way above the industry standard. Considering that this model packs a punch of incredible 3,100 PSI at 2.8 GPM, we were able to tackle the sturdiest, greasiest and the most stubborn of stains. The 4-mode `PowerDial` enables you to lower the power to 2,000 PSI for more sensitive surfaces, but keep in mind that this mode still packs a serious punch, so caution is advised. Checking its user manual can be helpful. Anything from wood, glass, metal, stone, marble, and concrete is considered fair game for this power washer. Moss, grime, grease, oil, rust, old soap stains and even seasonal dirt like leaves are no match for the power of this Generac model. It is a heavy-duty pressure washer that exerts an immense amount of power. The 4-mode `PowerDial` proved to be a good performance enhancer because you do not always need a full 3,100 PSI force to tackle the stain at hand. Car washing also proved to be a task where this unit excels, together with the rest of seasonal chores around the backyard. Even though the unit is mounted on 2 big wheels, it still is quite robust and heavy, so you will have to pull a little. Additionally, the lowest setting of 2,000 PSI requires extra caution when it comes to extremely sensitive surfaces, such as patio furniture made of softer woods and plastic. In these cases, maintain a safe distance and don’t use the pressure output directly above the surface. The nearer you are, the more you increase the power and risk of damaging fragile surfaces. Everyone has different needs when it comes to yard cleaning. This unit, however, will provide you with the feel of raw power, and it will not betray you when harder tasks are on the menu. Another comforting fact is that Generac is quite competitive in the engine and generator game. They mean serious business manufacturing strong and solid engines for their washers. So, there you have it, we have provided all the essentials in this Generac 6602 review so that you can make an informed decision. Everything you need to know is covered, and in case you have any further questions, feel free to post them in the comment section below.